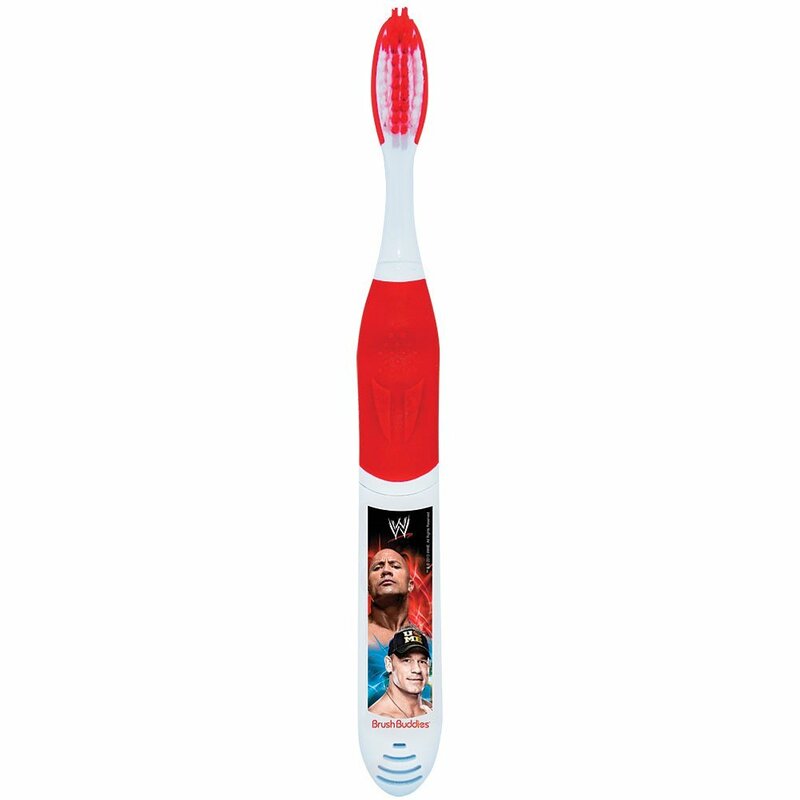 Someone Bought This: The Rock and John Cena musical toothbrush - WrestleCrap - The Very Worst of Pro Wrestling! Enlist your favorite stars from the ring in your fight against tooth decay! Press the buttons and the musical toothbrush plays two different theme songs–The Rock’s “Electrifying” and John Cena’s “The Time Is Now.” Each plays for the dentist-recommended 2 minutes, so you can play one for morning brushing, and one for nighttime brushing! Soft bristles and ergonomic handle design; includes replaceable brush head. Includes button batteries. And you can get 24 of them for just $203.54 or $8.48 apiece– what a deal! Or just buy one of them here. What they really need to do is make an Isaac Yankem, DDS version of this that plays his theme song as you brush. 9 Responses to "Someone Bought This: The Rock and John Cena musical toothbrush"
I wish there was a Gangrel toothbrush, it would belong in the Hall of Fang and that’s the tooth. Only 2 left in stock? Golly, better hurry before they are all gone. I’d like to believe that this was leftover merchandise from The Rock’s “Tooth Fairy” movie, only they added John Cena and the WWE logo. Oh man, I totally forgot about that movie! Good call! I’d buy one if they had an R-Tooth version. How about The Tooth Commission? Or a Cactus Jack one where he hails from Tooth or Consequences, New Mexico. Take this toothbrush, turn it sideways, shine it up real good … you know the rest. Okay this my last one for this, how about one for The Fabulous Molar.